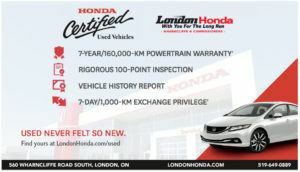 London Honda | Why Buy a Certified Used Honda? Honda Certified Used Vehicles are highly sought after thanks to Honda’s legendary reputation for durability, quality, and reliability. In order to earn the distinction of Honda Certified, each used Honda vehicle must pass a series of strict Honda Canada mandated mechanical and appearance inspections. Only vehicles that meet these rigorous standards are eligible for admission into the Honda Certified Used Vehicle program. Honda Certified Used Vehicles are offered special discounted finance rates from Honda Financial Services.